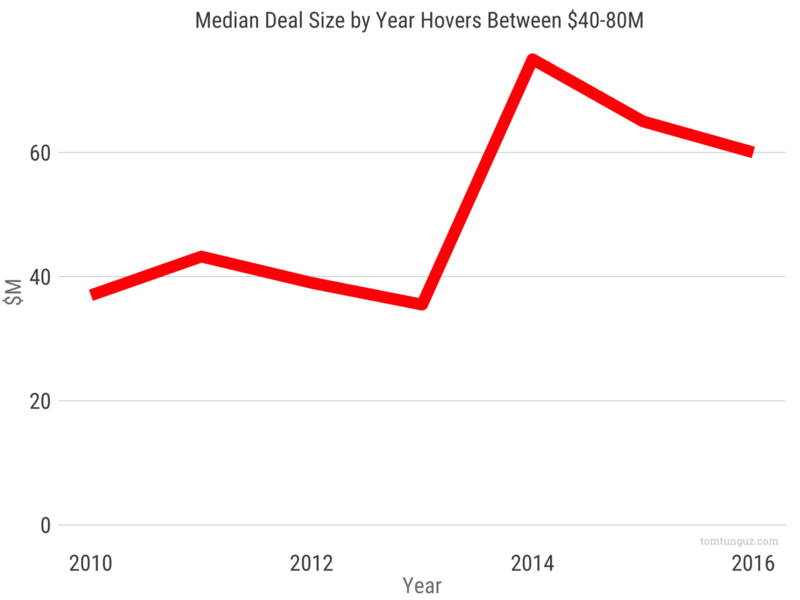 How Big is a Typical Software Company Acquisition? 2016 has been a volatile year. Major capital investments fell 55% in Q3. The IPO market is a tale of two cities with some companies able to go public and catapult their valuations, but the overall number remains in the single digits. Last, M&A activity seems quite brisk with more than 30 $1B+ billion acquisitions in the last nine months alone. How do all these factors commingle to influence today’s acquisition environment? And how does it compare historically? Year to date, $54B worth of software companies have been acquired. 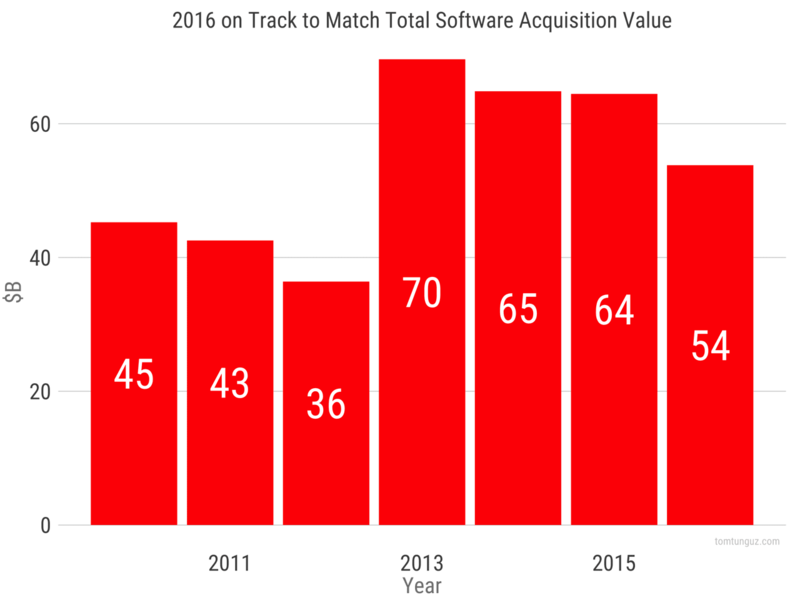 2016 is on pace to match the past three years of software acquisition trends which vary from $64B-$70B. However, in 2016 the total number of acquisitions will likely fall by 40% from an average of 150 per year to 92. Fewer acquisitions at higher prices. Over the course of those six years, the median acquisition price of a software company has varied between $40M and $80M and in 2016 has settled to about $60M. On the other hand, the average software acquisition is hurtling toward $1 billion in value after having plateaued around $250M earlier in the decade. That’s because the very largest acquisitions continue to increase in size. 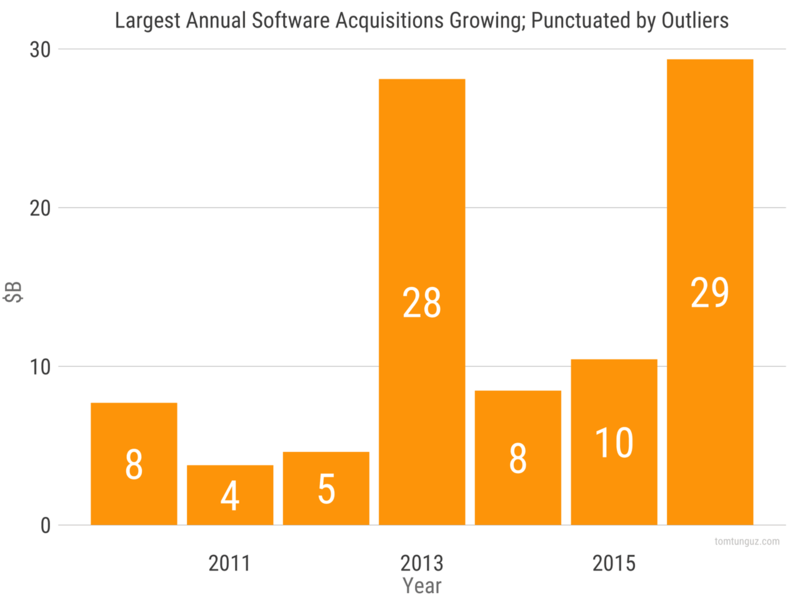 Whereas earlier in the decade, the largest software acquisitions varied from $4 to $8B, in the last four years, the smallest maximum acquisition is $8B and the largest is $29B. 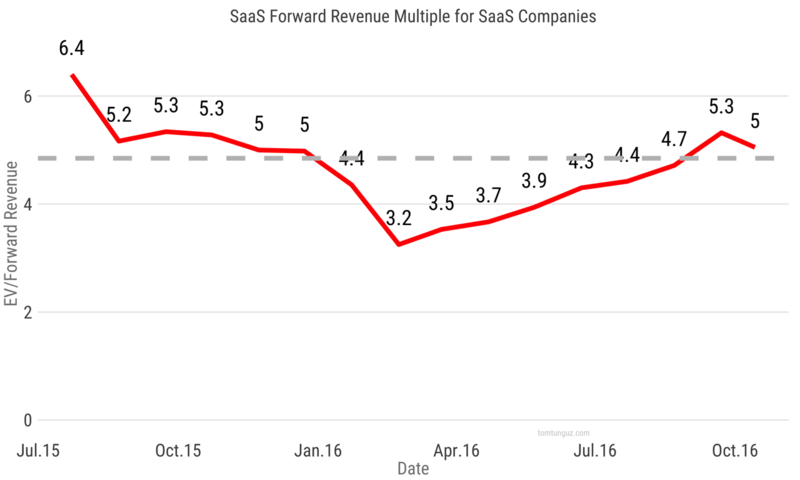 Interestingly, the total value of acquisitions hasn’t increased dramatically as one might have expected given the 57% reduction in multiples of SaaS companies in particular. Over the last few months we seen a reversion to the mean of about 5x forward revenues compared to recent highs of 7.7x (in early 2014) and lows of 3.2. In summary, the very largest acquisitions continue to grow larger,. Every company is becoming a software company and the transformational change that as a Service software delivery challenges incumbents to pivot their businesses to new models, often in the form of very large acquisitions.